Latest full point release patch: Use when you first install, before you proceed with anything else. Clan Mime official skin pack: Exclusive to Clan Mime! Extract the files to your baseq2\players\male folder. Beavis and Butthead client pack: Models, skins, and sounds. Boba Fett skin: skins only. Boba was a quiet Fett. Cartman sounds: Cartman (South Park) sound pack only; use with the Eric_C model for full effect. Eric_C skins: Cartman skin & model. Watch out for my rocket, fat boy. South Park models: Model/skin pack of the South Park gang. Homer Simpson client pack: Awesome death sounds and skin/models. Well worth the download. LaaLaa client pack: Everyone loves to kill their favorite Tellytubby. Very amusing sounds and model/skin. Kick mod pack 12: KICK is a team based mod for Quake 2 similar to soccer. The object of the game is to kick the ball into the goal. There are four modes of play. Weapons are allowed. There's even a team deathmatch mode just in case you don't like kicking balls around. Both server hosts and clients need this to play. Includes several maps. Kick Server 1.22g: Server hosts only. AZ Arena map: 3rd party map, features ball speedup areas. Ice Arena map: Few weapons, mainly focused on ball movement through kicking. Kickback Arena: Yet another cool map. Kick Station: And another map. The Outpost: And still another. Q-Pong mod pack: QPong is a teamplay mod where two to four teams face off in an arena, each with their own goal. As the match commences, a gigantic steel ball drops into the arena for each team. Manuever any of the balls into an opponent's goal to score. Each team starts with 5 points, and each time you score on them, they lose one point. When a team reaches zero, they are eliminated from the match and become observers (alternately, they can join the teams which are still playing). The challenge to QPong comes from moving the ball. The ball can be pushed or you can blast it with your weapons, causing it to roll at incredible speeds. The balls (which are larger than your character) can be used to crush other players, which makes staying alive a challenge as well. Also, walking into your own goal provides you with temporary invulnerability to the ball (players can still kill you). With this invulnerability, you can play goalie and stop balls with your body. Most levels feature Pinball paddles which will deflect any shots on the goal which don't come down the center. QPong also features running commentary from announcers and a number of server options to keep things interesting. Q-Pong server files: Needed only for server hosts. Q-Pong Linux server files: Needed only for Linux server hosts. QPong map pack 1: E5, Pinball, and Vanpong maps. QPong map pack 2: Uphill Battle, Bankshot Alleys, and The BallPit maps. Kodiak QPong: The Kodiak QPong map pack. QPong Maps collection: An archive of all QPong maps in one map pack. Jailbreak mod 2.0: Jailbreak is a deathmatch mod in the tradition of CTF. There are two teams, red and blue. Each team has a base, and in his base is a Jail. When you kill an enemy, he goes to your Jail. Likewise, when you are killed you will go to their Jail. Once you have team mates in Jail, you can free them by penetrating the enemy's base and hitting the switch to open the Jail doors. Other things of note: When your entire team is in Jail, you are all automatically EXECUTED and each member of the other team's score increases by the number of players on your team. You will then be spawned out of Jail. Getting Executed is bad, so try not to let it happen by freeing your teammates. Fraglimit is measured against your TEAM score, not indidual score. Note that you also recieve points (frags) for freeing people from jail. Jailbreak server 2.2: Only needed for those who will host the mod. Jailbreak Gold: A PAK of 5 high quality maps, named jbgm1-jbgm5. Required on both clients and server to play. Also features new sounds, jailmusic [some nice piano solos ;) muzak anyone? ], and graphics. Jailbreak map 2: A third party map for the mod. Jailbreak deathmatch map 2: Another third party map. Jailbreak deathmatch map 4: Yet another third party map. Jester JB: One more new map. HOS Jailbreak 1: Are we done with the maps yet? 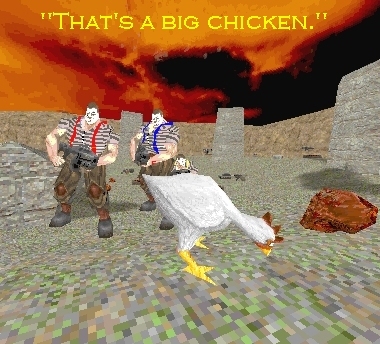 Q2 Catch the Chicken mod 2.0: Holy squawking chicken, gib man. Call it Rabbit, wacky Chicken style. One person grabs el pollo peligroso, which makes that player lose all weapons, but they gain points for ever second they stay alive. Meanwhile, everyone else is chasing the chicken-carrier, guns ablazin'. One file fits all.